’Nduja is typically served with bread or cheese but can used in as an ingredient. This recipe takes a basic tomato sauce and adds a little Calabrese spice and flair. Using a simple base allows the flavor of ’nduja to shine. 1. In a medium sized dutch oven or deep sauce pan sauté the onions in 3 tbsp of olive oil. 2. Add the crumbled nduja and mix well, let cook for about 5-minutes or so. 3. Add the white wine and let come to a boil. 4. Add the hand-crushed tomatoes or cherry tomatoes (halved) and the bay leaves, let come to a boil. 5. 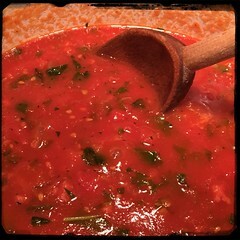 Once simmering, add the fresh basil, a bit of salt and pepper. 7. Let simmer for at least 20-30 minutes, add salt if need.